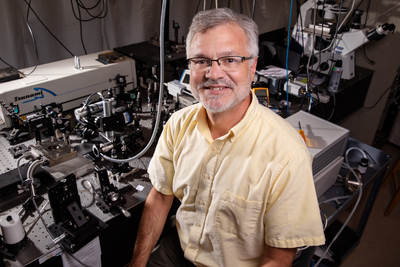 Materials science and engineering professor and department head David Cahill co-led research that helped optimize the synthesis of boron arsenide – a highly thermally conductive material – to help dissipate heat inside high-powered electronics. CHAMPAIGN, Ill. — The inner workings of high-power electronic devices must remain cool to operate reliably. High internal temperatures can make programs run slower, freeze or shut down. Researchers at the University of Illinois at Urbana-Champaign and The University of Texas, Dallas have collaborated to optimize the crystal-growing process of boron arsenide – a material that has excellent thermal properties and can effectively dissipate the heat generated in electronic devices. To reach David Cahill, call 217-333-6753; email d-cahill@illinois.